After a month in the bush of Canada we ventured back to Minnesota to attend our nieces wedding on the 14th. Although it was a quick trip, it was great time and it was good to see friends and family. Kris and Dave had a quiet wedding at my brother Bob’s house, the weather was sketchy but they were able to get an outdoor ceremony in before the rain it. When we returned we were greeted by hundreds thousands millions of mosquitoes! If you are out in the open during the day it was bearable but if you were anywhere in the shade or ventured out in the early morning or at dusk you are eaten alive. One thing we learned quickly is that our rig is not mosquito–proof. They somehow make their way in, I am guessing it is through the area around the slide outs as it is nearly impossible to make those air tight. Each night we kill at least a hundred before we go to bed. We also run a box fan on high in the bedroom to keep them from landing on us in our sleep. Today I ran some blue painters tape along some of the seams that looked like entry points so we will have to wait and see how it goes. So far tonight I think I only killed about 20 which is a vast improvement. We also got a chance to set up and test out the screen room we bought last year just for this reason. Overall I am impressed with how it keeps the bugs out and handles itself in the wind. We have also been going with Chad while he traps minnows this week. The resort goes through about 40-60 dozen minnows each day for the guests so minnow trapping is a daily occurrence. He traps both using nets and wire traps. The nets are about 50 feet long, cylindrical and funnel shaped. He places them in areas with high minnow concentrations and the minnows swim down the net (funnel) to an area that they cannot get out. The traps are about 3 feet long, made of wire and have an inverted cone on one or both ends. These are baited with bread and the minnows swim inside the trap through the inverted cone and cannot get out. A good netting will result in more than 100 dozen while a good trap could produce about 10 dozen. Only a few in this trap! One of the things we like to do is find remote lakes that no one has fished for a while. We will look at a map and Google Earth of the area and find a lake that has limited or no access. Many of these maps will show old logging roads. Once we find a likely lake we will use Google Earth to find the most likely route into the lake, create latitude and longitude GPS waypoints, gas up the 4 wheeler and chainsaw and see if we can get to the lake. Barb and I went on one such adventure ride the other day in search of a brook trout lake Chad he has heard of but has never heard of anyone getting to in recent years. The lake itself was about 40kms from camp with the last 6-10 kms being brush busting. We were able to find the old logging road that went near the lake, it was overgrown but passable with the 4 wheeler. As we were driving down the logging road, there on the side of the logging road was a huge moose antler! Bull moose will typically drop their antlers in January or February and this particular moose happened to be on this logging road when it dropped! We loaded it up and it now resides outside our trailer next to Barb’s chainsaw carving bear. We made it within 100 yards of the lake but that was as close as we could get with the 4 wheeler. With this information stored away, we will be back with our canoe and cut our way in the last 100 yards to see what we can do on that lake! Barb and I did get out fishing this week. We went to a lake that we had discovered last year. It again was a lake that Chad said the previous owner had fished but he has not heard of anyone fishing it in the 8 years he has owned the resort. We had cleared a logging road and just killed the walleyes, this is now a lake that Chad sends his customers to as well. This was also Daisy’s first fishing adventure for the year. She usually stays home but we were only going out for a few hours so we thought, what the heck, bring her along. She had quite the experience on the way there, she loves sitting on Barb’s lap with her head out the window and as we were driving down the gravel road we hit a pothole and boom, Daisy flies out the window! One second, she was on Barb’s lap, the next she is gone! Luckily Barb had her leash and harness on so she did not hit the ground, she just bounced off the side of the jeep a few times before Barb pulled her back in. it was a little nerve-racking for us and for the next few minutes Daisy gave me the stink eye like I did it on purpose! When we got to the lake, in 2 hours of fishing, we had our limit of 8 eater size walleyes and had released about 8 more. We also ventured to another lake that no one has been on since Chad has owned the resort. I had been by this lake several times while bear baiting in the past few years but this time I brought the canoe and Barb so we were going to see if there were any fish in it. Barb had the first fish within 15 minutes, a small pike. A little while later, she had another and another. I think she had 6 pike before I had my first fish. All in all it was a good day. We caught between 15-20 pike, nothing huge but a fun lake to send someone to if they want a lot of action. I think she is still giving me the stink eye! Our third outing was another exploration adventure with our four wheeler and canoe. There is a small lake on the map that is adjacent to a really good pike lake so I thought maybe…….maybe there was a stream between the two and there was pike in there as well. It was only a 7 mile 4 wheeler ride from camp. On the way there we must have come across 10 hen grouse with a clutch of chicks. The chicks would scatter as we approached while the hen would feign injury in an attempt to lure you away from the chicks. If that did not work they get aggressive and attack you! When we would come across a clutch in the tall grass Barb would walk in front of the 4 wheeler to make sure we did not run over any and about ½ the time she would get charged by the mom! It was hilarious, the hen would hiss, puff up and charge her! We eventually made it to the small lake despite the killer grouse and a few downed trees. We fished it for about 45 minutes and……nothing…… it was a dead shallow lake. Oh well, can’t win them all. So we packed everything up and headed to the nearby pike lake where we spent 3 hours catching 9 fish (Barb 6, Jim 3 but who is counting). On the way back we ran across more killer grouse and a couple of turtles that we had to maneuver around on the logging roads. Mama grouse in attack mode! 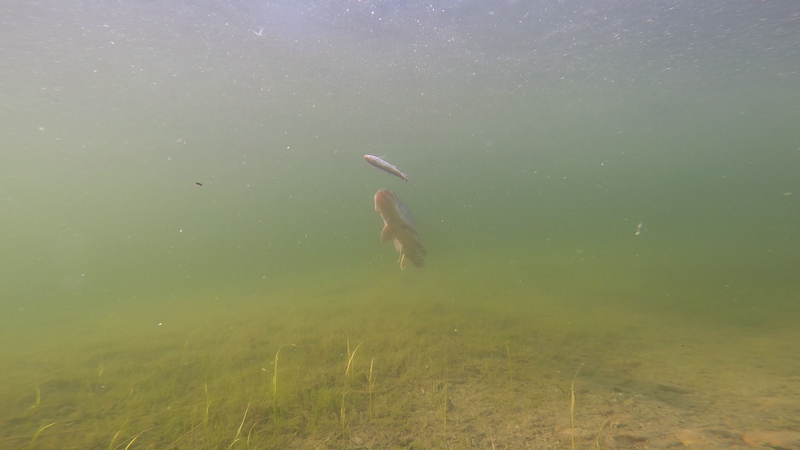 I also got a chance to play with my GoPro and get some more underwater video of fish. 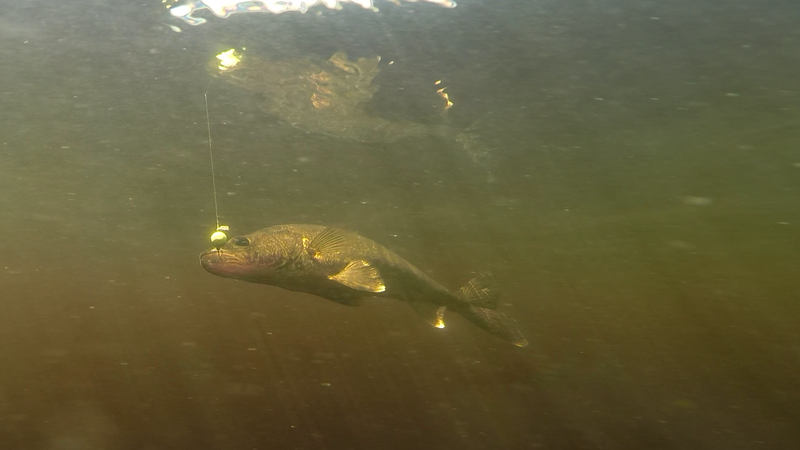 I still need some more practice but I got some underwater video of a few walleyes we caught and a really cool video of my pet northern. 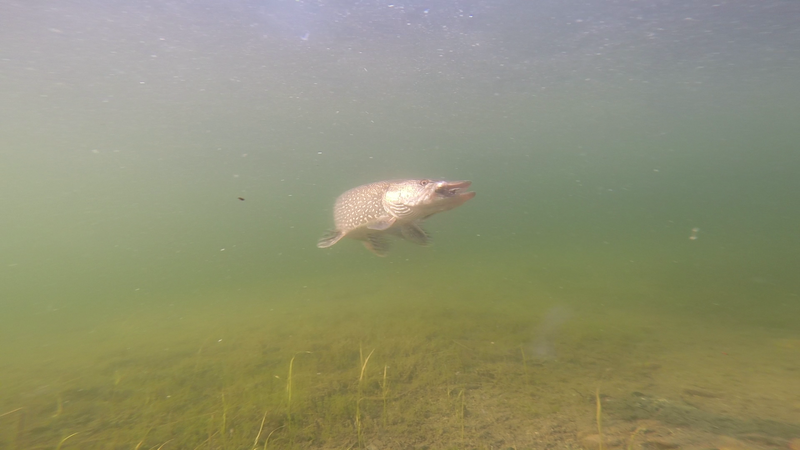 There is a northern about 34” that hangs around and will eat minnows that are thrown to him. 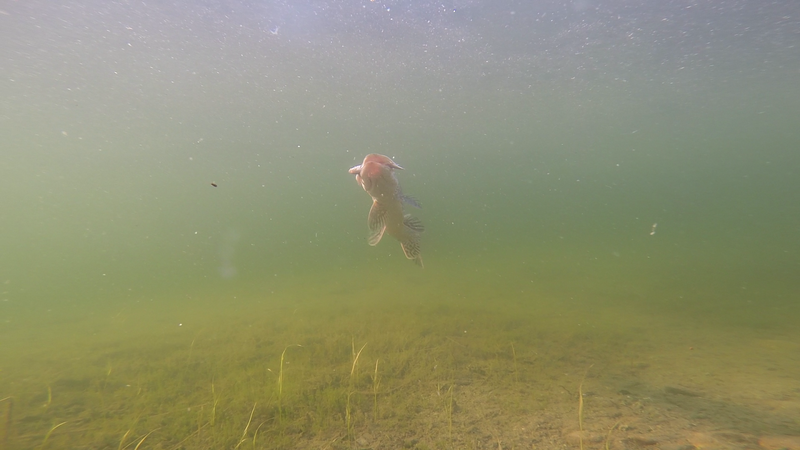 One day I got my GoPro and he was very cooperative while I videotaped him. I will work on editing the video, post it on YouTube and copy the link to the blog. In the meantime, below are a couple of action shots from the video. Footnote: No animals were harmed in the making of this blog…..well, maybe a few fish and a couple hundred mosquitoes but Daisy is doing just fine. Three days of rain resulted in minimal pictures this week, flooded boats and roads. Over 6” of rain can really wreak havoc on a fishing resort. We had two boats swamp and near record water levels. Many of the fishermen still went out and did well with fishing. As for ourselves, I got out three times last week and Barb got out once. I finally got a chance to get back up to Northwind to recover those boats we abandoned due to the ice flow that blocked our return to the landing. I had to bring a chainsaw and cut a few trees that had fallen across the river where I needed to get the boats but eventually got them back to the launch. Work done, I thought I am on the lake, I may as well get an hour or so of fishing in. I headed out to one of my favorite spots and quickly had a 17” walleye on the stringer. Pretty soon the wind and the rain picked up but so did the fishing! Within the span of an hour I had boated and released 5 more walleyes, 3 of which were over 26” and 2 more over 23”. The entire adventure reminded me of the scene from Caddy Shack where the priest went out golfing in the lighting storm and had the round of his life. Here I was, in the pouring rain getting pounded by waves, catching one huge fish after another! That scene did not work out so well for the priest in Caddy Shack so I thought I better get off the lake and headed for shore…. but what a memorable trip! The next day Barb and I went to a remote lake about 70km’s from camp but with the roads in the condition they are due to the rain it took us 2 hours to get there. On the way to the lake we saw a cow moose and a huge wolf. Once we launched the boat we fished the mouth of an incoming river where Barb had caught a 25” walleye last year. The river was really moving into the lake due to all the run off so it made it very difficult to hold the boat in position. After being in this spot for about 15 minutes Barb snags her jig on the bottom of the lake. She is yanking on it trying to dislodge it from the rock or log it is stuck on when the line starts moving out into deeper water, it is not a snag at all but a giant fish! I maneuver the boat trying to follow the fish so it does not run all her line off the reel and help her fight it. For 4-5 minutes the fish just stays in the deep water. She eventually horses it off the bottom and it comes up near the boat and we get our first look at it, it is a HUGE northern! Barb caught at 43” northern two years ago and this one was much bigger, at first glance I would estimate it at 48-50”. The fish sees the boat and simply turns and swims back to the bottom, not rushed, not even acting like it is hooked, just turns and swims away like it is the top fish in the lake and does not care it has a line trying to pull it the other way. Over the next 5 minutes we get it near the boat two more times but not close enough to get a net on it. Eventually the fish swims back into shallow water where there were deadfalls and debris from the inlet of the river. As I am operating the motor trying to keep it in deep water, Barb is trying to keep it away from shore with her rod. Eventually the fish won by getting into the brush and breaking off the jig. I was expecting Barb to be really bummed out losing such a monster fish but the first thing out of her mouth was…”wow, that was cool!” We fished throughout the lake picking up a handful of walleyes and eventually returned to the area where she had that pike on, but it either left the area or wanted nothing to do with us but we will be back! I also got out to Onaman and fished with Kazi and Yoko, a couple in the area from Japan. He spoke some English while Yoko spoke very little. They showed up in camp yesterday unannounced and no reservations and asked if there they could stay here and if someone could take them fishing. Kazi, a 69 year old physician from Okinawa, said he bought a fishing pole yesterday and wanted a big walleye as he had read about them but had never caught one. Kazi and I fished while Yoko watched and took pictures. I went to one of my favorite reefs on the lake and started catching some nice walleyes, meanwhile Kazi was having his own good luck catching northern pike…… Yoko insisted on taking a picture of each and every fish we caught laughing and giggling the whole time! After his 4th pike in a row, I started calling Kazi “Pike-man” and he started calling me “Walleye-man” Yoko thought that was the funniest thing in the world and giggled while she continued to take pictures of our catches. Kazi caught two more pike and Yoko was calling him “Pike-man”. Finally Kazi got the hang of getting his jig on the bottom and started catching walleyes. By the end of the day he was a “Walleye-man” as well. The biggest fish of the day was a 25” walleye Kazi caught late in the day. As we released that fish he said he was done and wanted to head back to camp. On the way back to camp we saw 5 bears including this sow and cub who were nice enough to pose for pictures for us. The adventure of the week goes to a group that was in camp last week. The group consisted of a father, his two 8 year old twins and an adult friend. They did not get out fishing two days due to rain but when the clouds parted they booked a charter on Lake Nipigon which is about 30 miles away. Lake Nipigon itself is about 60 miles wide by 90 miles long, a huge body of water. They were going for trophy pike and brook trout. Day turned into evening and past the time they should have been back. Evening turned into night and they were still not back. The other groups in camp became more and more concerned about them. So many things could go wrong out there, hitting a submerged rock or log, engine trouble, running out of gas………There is no way to effectively look for them ourselves in the dark on such a big body of water. Chad eventually called the OPP (Ontario Provincial Police) and reported them missing. As a general rule, they will wait until morning to search of lost parties. I woke up the next morning hoping to find their truck parked in front of their cabin but when I looked, there was no truck. Hoping for the best, we waited to hear the search results. About 11:00 that morning we see their truck pull into camp and did they have a story to tell! About 3:00 the afternoon before the head on their engine blew so they were dead in the water. They were able to paddle to shore near an area where the guide had a camp set up several years ago, once they got there they were able to build a makeshift shelter with a tarp, build a fire and even cook a few fish. Once the sunset they knew they were there for the night. According to the dad everyone had slept pretty well except him as he was tending the fire. The next morning about 7:00 he said he heard the whoop whoop of a helicopter in the area and said that he was never so relieved to see it settling down on the beach in front of them. The next part I would not believe if I did not see the pictures myself……. Once they helicopter landed the pilot got out holding a pizza and said “Did someone here order a pizza?” After taking a few pictures the pilot said they could take their fishing rods but everything else had to stay there and be recovered later. The helicopter took off with the group and landed them within a hundred yards of their truck at the marina! Although that group headed home a day early, everything ended well, they even booked to come back next year. You can read more about this adventure and see pictures of the helicopter and kids eating pizza by clicking the link to the Pasha Lake website on the right side of our blog page. All in all it was a great week and I learned a valuable lesson…….how to get a pizza delivered out in the bush!